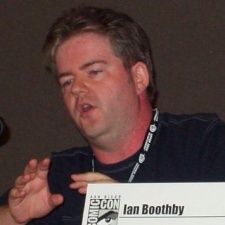 Ian Boothby is an Eisner Award-winning writer for Bongo Comics. He began in 1998 in Simpsons Comics #34, and today has written well over fifty stories in Simpsons Comics, Futurama Comics, where he is the author with the most credits, Simpsons Super Spectacular, and Treehouse of Horror comics. He also writes his own self-made comic books. This page was last edited on 18 February 2016, at 21:29.